Upgrade your runes! A special Power-up Stone Event will begin shortly. 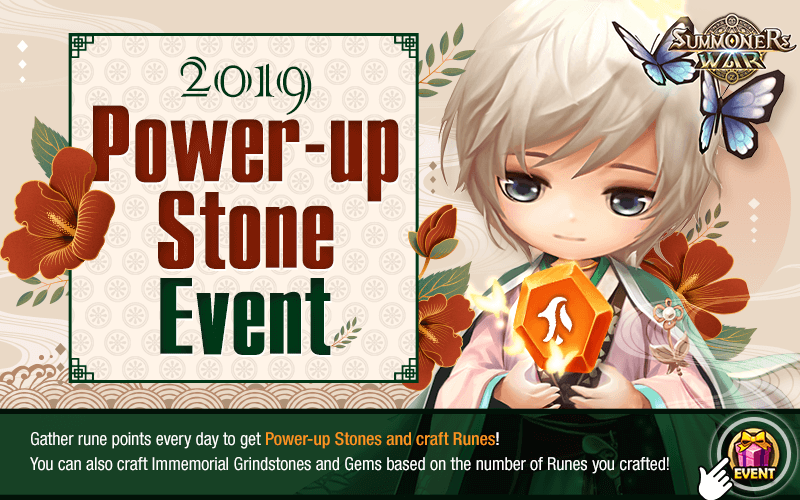 Gather rune points every day to get Power-up Stones and craft Runes! You can also craft an Immemorial Grindstone and Gem based on the number of Runes you crafted! Event 1. Gather the points every day to get Power-up Stones! * You can collect up to 150 rune points every day. Event 2. Gather 150 points every day to get [100 Energy + 100,000 Mana Stones]! Event 3. Craft Runes with the accumulated points! Craft a 5 - 6★ Rune (rare grade or higher) with 150 rune points! Event 4. Craft an Immemorial Gem/ Immemorial Grindstone (Hero grade) based on the number of Runes crafted! When crafting, you can select a property of your choice. Event 5. Get rewards based on the total points you collected during the event! The [rune power-up success rate will be increased by 2 times] when you use the Power-up Stones! Check the power-up stone before tapping the [Power-up or Auto Power-up] Button! The item can be used on all types of Runes. You can amplify the sub-properties of Runes. The item can be used on all types of Runes. You can change the sub-properties of Runes. - [Points Collected Today] will reset every day at 7am PST. - You can collect only up to 150pts for [Points Collected Today] and up to 10 Power-up Stones a day. - Runes acquired via Magic Shop and Achievements won't count. - 150pts will be deducted when you craft a Rune, and up to 14 Runes can be crafted during the event. - You can craft an Immemorial Gem when you crafted 7 Runes and an Immemorial Grindstone when you crafted 14 Runes. You can't change your decision once you craft the items. - The Power-up Stones will expire on Mar. 3rd 6:59am PST. Please make sure to use all Power-up Stones before they expire. - The event rewards will be available for another 24 hours when the event ends. - The duration and remaining time for the event will be displayed in the time zone of the area that you reside in.